This is a move to Euro-positive parties not one to pro-Euro in itself. The pro-Europe influence was very small. This was mainly who will be the biggest party and who will provide the PM. But it is an anti-populist policy vote. These should work on their presentation less oneliners shot from the hip. The story starts with Mr Roemer (Socialist) who did very well with the voter and his party went the last years continuesly up in the polls. The first deciding moment was when the SP could have become the largest party (in the polls) and the one that basically provides the PM. Mr Roemer however for everybody with one braincell is clearly not PM material. However his party brought the PM issue up. And clearly played that card in the campaign. That went sort of ok until Mr Roemer had to go into serious debates and he was clearly exposed. Which started a large move from The SP to Labour/PvdA whose main man Samson did very well. It also had already woken up the voter on the right who saw Mr Roemer becoming PM as the last thing they wanted. The PvdA got the momentum and was tearing massively votes away from the SP. The rightwing who saw now Mr Samson iso Mr Roemer as a potential challenge for their Mr Rutte's PMship also saw Mr Rutte pulling a lot of votes from his main 2 competitors (Wilders and CDA) and D66. Ending up with both having around 40 seats of in total 150. However 40% of the voters were till the last day undecided. And looking at preferences probably 10 of the VVD seats and 20 or even more of the PvdA seats were either strategic voting or due to the good campaign their own leaders had and the poor one their direct competition had. Simply real last minute votes and not stable. This effect is pretty relevant mainly for 2 issues. -A cabinet needs basically both VVD and Labour. Other majority options look nearly impossible. Hopwever these 2 combined do not have a majority in the Senate (and are not very likely to get one the next election). It might be a problem it might be not, but stable is different. Therefor still either the D66 or the CDA will likely have to join the cabinet. Both are in between the 2 large parties so no real huge obstacles for that. -cabinet looks not really stable (whichever it wil be). Now they have had a good campaign and the competition a horrible one, but that is simply not a given for the future. The cabinet will have to do some unpopular cuts to make ends meet and supporting the Euro is till very unpopular. So things can change easily. Both leaders of the 2 large parties have clear and huge weaknesses. Rutte is a Dutch Cameron and Samson a former left wing activist and his party has still a lot of jobhunters running around (who are pretty unpopular). And they havenot been attacked on that yet and certainly not properly. Wilders looks to realise his mistakes. Basically no more stupid one liners, oneliners ok but backed up with some sensibel talk. Make the Eurocase simpler, put immigration back and blame that via things like Schengen also on the EU. SP are pretty well organised (unlike Wilders). Their main mistake was not coming up with a proper PM candidate iso, better next to Roemer. And work on making Samson and his party unpopular. Samson look to break when put under pressure over a file he doesnot really master. His party still has a lot of very unpopular people walking around, focus on those and show them as job hunters. Work on the activist past of Samson. In other words it is not rocketscience what they will have to do and very likley will do. Government will likely be more or less stable for 2 years, but a referendum on more Europe succeeding is as unlikely as a few weeks ago. Will depend also on how successful the renewed opposition is. And if some larger things go bad in Europe. 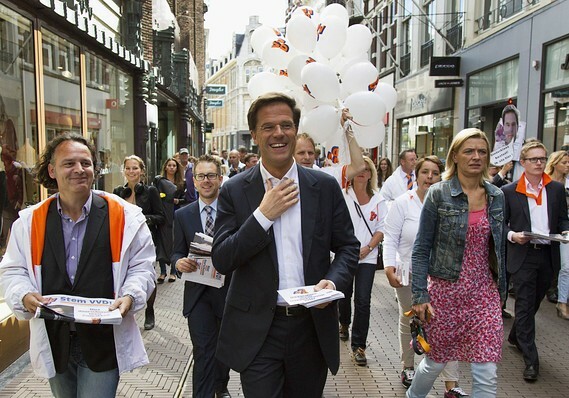 If it works they will put a lot of pressure on both the VVD and PvdA to become more Euro-sceptic. And btw the current/next PM is more Euro-sceptic than Merkel anyway only misses the technical ability/qualities to push it through in Europe. Austerity is marginal difference between the 2 is may be 0.5% more deficit. Samson is no Hollande. I wonder how honest the Dutch elections were. In fact, I wonder how honest ANY electons of EUSSR nations are any more, with the political elite of all ofthose countries being so closely allied with the EUSSR political elite/so-called "Commission." Doesnot look to be anything wrong with that. Probably fairer than even in the UK. You actually have something like 12 parties in parliament there. People can vote for pretty weirdo parties Party for the Animals got 2 or 3 seats. And could have real influence if a cabinet is balancing on the border between majority or not. The Dutch Taliban the SGP (against women voting, great idea btw) helped the former government to pass some legislation and got things in return. Looking at these elections there are probably too many parties in Holland. Many people voted for one of the 2 biggies to make their vote count more. But that is not the same in every election. Problem is always in other things. Like the UKs de facto 2 party system, which makes starting new parties for new developments (like anti-EU) extremely difficult to nearly impossible. The Euro-sceptic group in Holland was still seen as semi-pariahs (they are a bit weird tbo but for other reasons). Information: often biased very few media are really trying to be impartial, most have a clear preference. Take your BBC, looks clearly left of the centre (from taxpayer money). Huge influence by Murdoch before (at least not from public money). In Europe it looks like the pro-EU wing of the media is clearly overrepresented and looks to have much larger budgets. Very few people understand this crisis and most people will base their vote on signals that most of the time donot show the whole picture. If you are able to supply much more of these signals than the other side you have a huge advantage. In Holland the majority of the press is clearly but not extremely left from centre. It is getting better with commercial TV stations, but still these are overrepresented. So the Dutch Socialists SP not even to mention Wilders simply get usually somewhat to pretty much (for Wilders) negative press. And generally the Dutch press is pretty poor. They donot have the real garbage like Sun, Bild, but also no real quality (only ones that pretend to be quality). Media is the thing to watch, not East block style elections. You donot have to make them worse than they are they are bad enough.